Josh Blake got Racing Club back on level terms in the 89th minute. 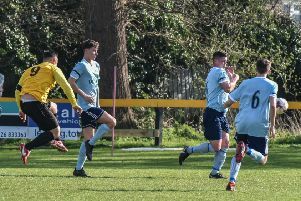 Racing Club Warwick marched into the quarter-finals of the Polymac Packaging League Cup with a superb win over Premier Division opposition Boldmere, described by manager Scott Easterlow as his best moment at the club. After falling behind in the 13th minute, the home side had to wait until the 89th to get back on level terms, with their winner coming in stoppage time. However, a delighted Easterlow said that despite the lateness of their goals, no one could argue with the outcome. “Wow what a feeling, my personal best moment so far since being at the club,” said Easterlow. “Considering we were playing a side from the league above us who drew last Saturday with a team like Coleshill shows how far we have come as a team in a short space. “The result doesn’t really tell the story. We were undone by a corner early doors which is disappointing as we weren’t set up properly and we paid the price. “But after that, we were much better and settled into a rhythm. “There was only one side looking to play any type of football after that, we just needed a bit of quality in the final third. “It was the easiest half-time information we ever had to do, just keep doing what you are doing and it will happen. Racing Club, who had several players cup-tied and unavailable and the influential Alex Price out ill, brought in Ross Briscoe for his first appearance for the club and it was the substitute’s fine individual strike which settled the tie. “When you have someone like Briscoe around, he can just do something off the cuff and change a game in a instant and he did,” added Easterlow. “His goal will definitely be worth a watch on the highlights. “But there were so many good performances. “We had four cup-tied, three away, one ill. I dragged two lads in to help us through the night and we dominated a team from the league above. The visitors got off to a fine start, firing just wide after a good turn by their number nine. Boldmere were looking dangerous with several crosses testing the Racing rearguard and it was from one such delivery that they got their opener, centre-half Joe Lyng powering home a header. Trea Bertie’s pace was causing Boldmere a few problems in the first half, while Luke Church stabbed a shot just wide. However, Boldmere went in at the break with a one-goal advantage. The hosts were much improved after the interval, with Rich Powell pulling the strings in the centre and wing-backs Ryan Billington and Jack Taylor looking dangerous as they attacked down the flanks. The better side for the second 45, Warwick moved the ball around well on an increasingly difficult pitch and Bertie almost equalised when he chased down a through ball but his shot slid agonisingly wide. The visitors were reduced to ten men when Alex Forde received a second yellow card after bundling over Josh Blake in the box. Martin Slevin stepped up to take the resulting penalty but his powerful shot hit both posts before the danger was cleared. The introduction of Liam Naven-Jones and Briscoe further pepped up the home side but it needed a fine save from Tom Cross to keep them in the game after a rare forward foray from the visitors, the Racers number one turning a point-blank shot around a post. Racing kept pressing and just when it looked like their efforts would count for nothing, Naven-Jones raced through. The keeper blocked his effort but Blake looped the ball back into the net from the edge of the box to bring his side level. Briscoe then sparked jubilant scenes with an injury-time winner, turning his man and firing across the keeper and into the net to set up a last-eight tie at Walsall Wood.